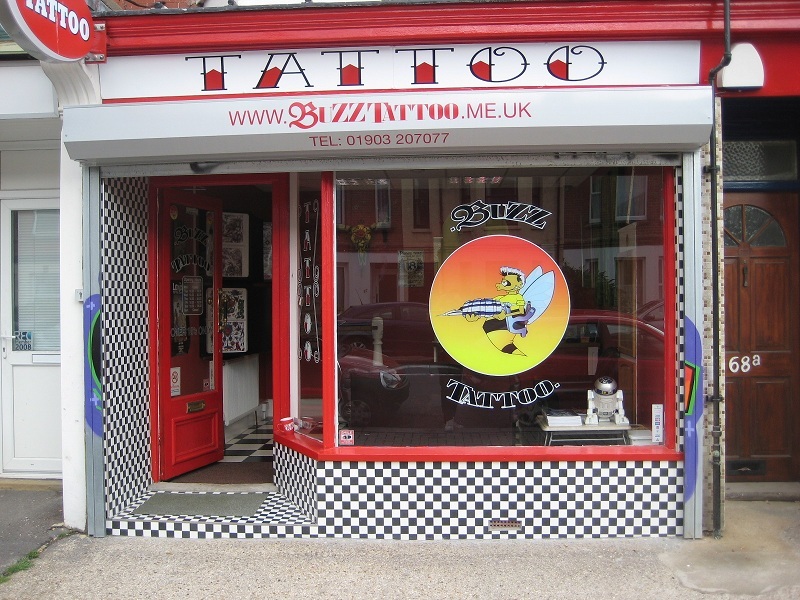 Please find below details of Buzz Tattoo this tattoo studio is located in the town/city of Lancing in West Sussex. We have 22 reviews for this tattoo studio, if you would like to add a review - click here. I first met chris at his private studio i was nervous due to a bad experience chris made a fantastic job out of a cover up. i have since been to his new shop where it is clean friendly and i wouldnt go any where else chris makes you feel at ease and the work is outstanding. Just wanna say thanks to Nathanial at Buzz for my amazing tattoo, although nervous, he and Gemma and Chris chatted the whole way through, thanks again guys, I will try and not be back for another one, lol. There is no point going anywhere else, Excellent tattoo work,(has done a lovely Ska/Two Tone for me). Very friendly atmosphere, very clean....and the best taste in music!!! Top fella! Awesome people! I had Chris tattoo me a mighty fine bit of freehand art! Also had some lazer treatment with these awesome people, make you feel at ease will most def be going again when chris finishes with my lazer for a new bit of art!! If you ever want a new tattoo or are getting your first one this is the place to go!! Have had a full sleave done by Chris Hawkes and was most impressed with his work and studio. Would recommend Chris to anyone looking for a 1st class tattoo artist. Quality work, i'll be back soon - what more can i say ! Just got back from Chris' lovely purpose built studio. Adding to my first tattoo, Chris took an image I'd found and developed it into a freestyled stars print - very girly, very 'barbie' but I love it and he didn't tell me how naff it was even though I knew he was thinking it! Couldn't recommend him and the studio more as I not only felt comfortable, but it's got loads of things to look at which really helped me relax. Brilliant atmosphere - ask to see the new tattoo Chris got in America. Now THAT is art!!! Chris is a geezer. He takes the piss out of my tattoos, then does a great job of doing more. He knows what he is doing!! Helen recommended Chris to me and for good reason! Really friendly atmosphere and superb talent. Really pleased with the final result - a butterfly on my neck. Chris is a great bloke, his price was fair and his work is very good.